I have a new layout and card to share today for Hip Kit Club, using the June 2014 Hip Kit & Add-On Kits! This was one of those layouts that had a major disaster, but I just went with it and I think everything turned out okay in the end. I had the layout almost completely finished and decided to add some Color Shine. After a few sprinkles, I started doing something else, and then picked up the bottle to add some more drops. I always shake my bottle before using it, and so out of habit I shook it again...and never closed the cap from last time. UGH! Color Shine went all over my page, the photo on the right, my desk, my mouse, my mouse pad, my phone, and my table. It was a mess!! But I was able to get the photo off and reprint it. There wasn't much I could do about the background paper, so I just decided that some big drops of Color Shine were okay, and that I could live with it!! I love that we received the Elle's Studio Shine Bits & Pieces in the June 2014 Hip Kit. 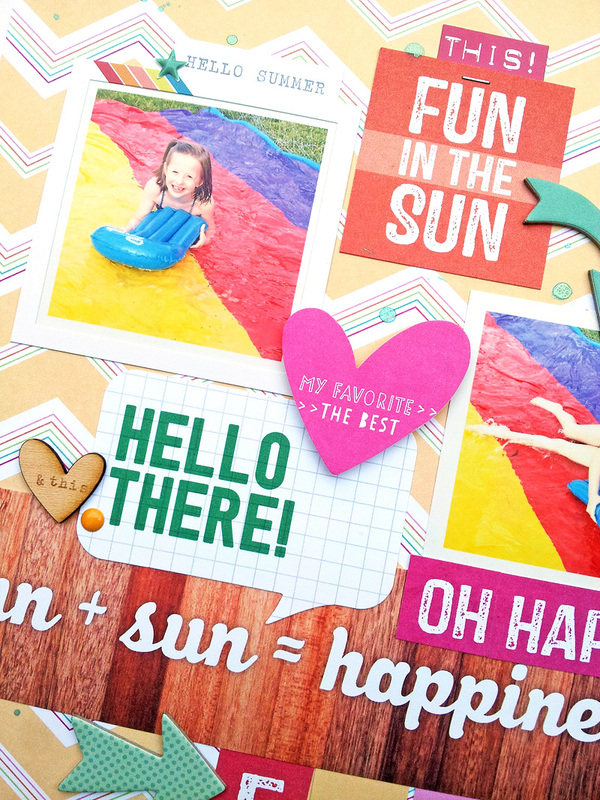 There are so many pieces, that they can be used on multiple layouts! I used several pieces from the pack, to create my design on this layout, and still have some leftover. Once I decided on the Elle's products to mix from the Kit, then I pulled in the October Afternoon chipboard arrows and a few stickers from the Echo Park Capture Life sticker sheet. Love how everything coordinates so well together. I like to play with different colors and patterns, and cards are a perfect way to do this. 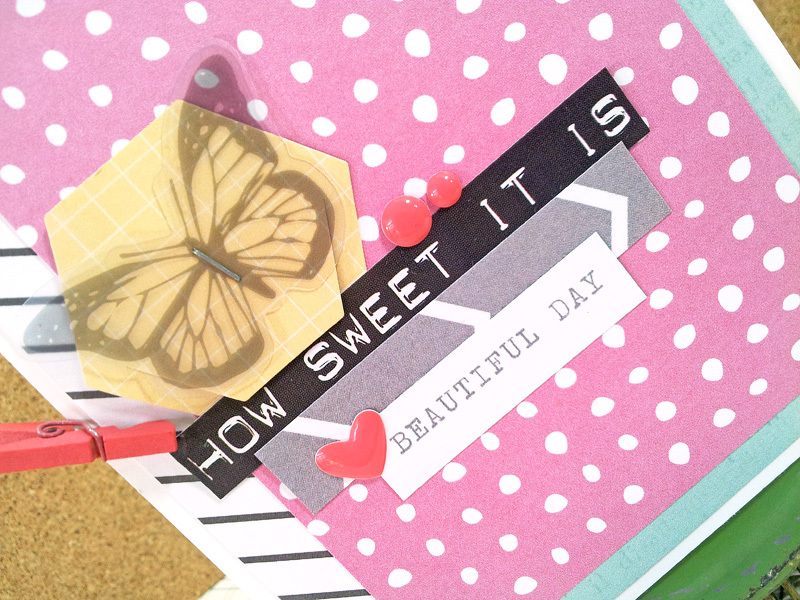 I paired the American Crafts patterned paper, with the fun Polka Dot paper from Elle's Studio, for the base of my card. And I didn't want to cover up much of the Polka Dot paper, so I created a small cluster, using some of the embellishments and stickers from the June 2014 Hip Kit. I have one more layout and card to share with you, using the June 2014 Hip Kit & Add-On Kits, and then I'll start sharing my projects using the new July 2014 Hip Kit & Add-On Kits! Visit the Shop, to purchase your July Hip Kit and Add-On Kits!! Hip Kit Club & Elle's Studio Blog Hop GC Winners! A Flair for Buttons | Nice Catch & a Fish Too! The Cut Shoppe Gets It's Own Blog!